In This Tutorial You Will Learn How To Wind Square Root Quickly, Easily & Smartly by using some shortcut tips and tricks. Learn How to find the square root just by looking at the number in less than 3 seconds. Helpful technique for competitive exam aspirant like CBSE(ix & x), NTSE MPSC, SSC, UPSC, IAS, IPS, NDA, CDS, RAILWAY, LIC, IBPS, SBI, GMAT, , GATE, MBA, CAT, GRE, CET, CSAT, MAT and other competitive exams. and actually started hundreds of years ago as a dot with a flick upwards.It is called the radical, and always makes mathematics look important! Every non-negative real number a has a unique non-negative square root, called the principal square root, which is denoted by √a, where √ is called the radical sign or radix. For example, the principal square root of 9 is 3, denoted √9 = 3, because 32 = 3 × 3 = 9 and 3 is non-negative. The term whose root is being considered is known as the radicand. The radicand is the number or expression underneath the radical sign, in this example 9. There is a difference between the “principle square root” and “square root”. Let’s take the number 9 as an example. What is the square root of 9? There are actually two answers: 3 and -3. 3 squared is 9 and -3 squared is also 9. So if you were asked the question what is the square root of 9, you would answer +3 or – 3. The principle square root is the POSITIVE square root for any given number. So, if you were asked the question what is the principle square root of 9, you would simply answer 3. 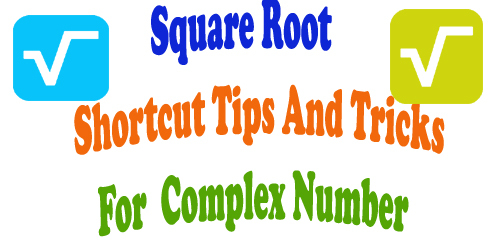 The Square Roots video useful for time saving in competitive exams and for teachers.You can solve a problem within short period.